I loved the Harry Potter books. A combination of great characters, riveting plot and wonderful word pictures always grabs me, and J.K. Rowling certainly delivers the goods. At the end of three weeks, I'll let a chicken choose five random winners, notify them, and send their postal details to the US company which will arrange delivery. 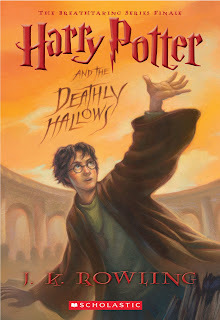 "Harry Potter and the Deathly Hallows is a breathtaking finish to a remarkable series. The final chapter to Harry Potter’s adventures will be released in paperback July 7th! It all comes down to this - a final face off between good and evil. You plan to pull out all the stops, but every time you solve one mystery, three more evolve." In keeping with these Harry Potter mysteries, I have cunningly hidden my email address somewhere on my blog for you to find! If you're a Harry Potter fan too, check out Scholastic's web site for heaps of fun things to do. Grab bookmarks and screen savers, watch a video of JK reading, play games, and discover your Hogwarts Personality Profile (the Sorting Hat put me in Ravenclaw).